Perk up your day at the office knowing that you have a delicious fresh lunch and cool drink packed in this stylish cooler or lunch bag. It is also ideal to take on a day trip or a hike. The front of the bag sports a flap that that covers the one main compartment. The flap is secured with a double Velcro closure for quick and easy opening or closing. The interior of the bag is lined with silver foil to help keep your food or drink at optimum temperature. A strong strap is stitched along the sides to make it more secure and easy to handle. Decorative stitching around the edges adds to the overall modern look. The cooler bag is made from 420D polyester, a strong and durable material that is ideal for use outdoors and won't fade in the hot sun. The light-weight lunch bags can comfortably fit an average sized lunch box and a small juice box. When not in use, the bag packs flat and will use up minimal space. Choose from a number of exciting colours. We offer white, yellow, red and cobalt blue. Branding these cooler bags with your personalised company logo and image and giving them away to your customers is a great opportunity for you to get your brand's name out there and noticed. 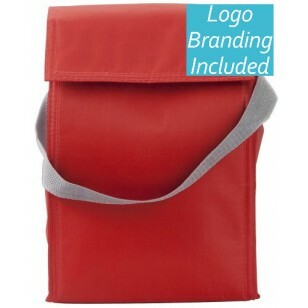 We offer silk printing and transfer printing to have your logo printed onto the lunch bags. A once off set up charge of $75 applies. Prices exclude GST. We offer a fast turnaround time of 2 weeks from approval of artwork and can speed this up for urgent orders.